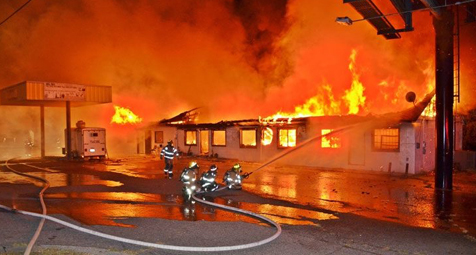 On September 9, 2018 at 3:30 a.m., Nash County (NC) 911 Center received calls for a large building fire on the 3300 block of Benvenue Road in the Dortches section of Red Oak. Fire departments from Station 12, Red Oak, Station 9, Battleboro, Station 4 West Mount along with Nash EMS units were dispatched. The Red Oak fire department arrived on location in five minutes. Chief Bob Brown reported that he had a large commercial building, 100 x 50 feet wide, heavily involved in fire. He requested an additional special call for more departments to be dispatched from Station 14 Nashville. A special call was put into the City of Rocky Mount (NC) Fire Department for their ladder Truck 20 and Engine Company 4. The Red Oak Fire Company laid out three sections of five-inch hose for a water supply line; they also stretched in two 2 1/2-inch water lines to fight the fire. The next-due engine company from Battleboro arrived, and also went into service with two 2 1/12-inch water lines. The Rocky Mount engine and ladder subsequently arrived along with West Mount Station 4, who were laying out 1000 feet of five-inch hose water line to supply water to Ladder 20. The ladder truck had difficulty setting up due to large, electric line metal poles that were over 60 ft. high carrying many dangerous high-tension wires down the road. The ladder truck was forced to move to another location across the street to set up. Captain Jason Floyd, figured out a way to supply water safely to the fire by setting the ladder straight up in the air 98 feet high (see photo of Ladder 20 in its position.) Battalion Chief Roupp and Captain Johnson went to the rear of the burning building which was not yet all on fire when the ladder company started to send their water on to the fire straight down over the electric pole tops. The water was now going over the roof top of the burning building. The two officers used their radios to direct Ladder 20 Captain Floyd the direction to turn the water to his left or right or up and down so that the water was hitting the roof top of the burning building. The other difficulty firefighters faced in using the 2 1/2-inch water lines on the blaze that were making a quick knocking down most of the flames from the ground level, causing heavy smoke conditions. Ladder 20's men were in the bucket and had a hard time seeing the burning building due to the heavy smoke condition and having been up that high, so they had to rely on the two officers by radio to direct them in the right direction. This action took place for more than 30 minutes and Ladder 20 was able to knock down most of the roof fire and burning rooms. This enabled the ground-level firefighters time to set up three additional 1 3/4-inch water lines allowing them to enter the burning section of the stores and knock down the internal fires. The fire was contained by 40 firefighters after a little more than an hour. Members stayed on the scene for a few hours, overhauling areas and hitting hot spots. There were no reports of any injuries. The building was formerly a grocery store many years ago and recently converted to smaller businesses that are still using the space to sell their merchandise. The entire business and building is now a total loss, according to Nash County Fire Marshall John Frazier. The cause of the fire is still under investigation. All buildings are safer during construction after drywall and sprinklers are installed for those that live or work in the buildings and for firefighters who may be called in to a fire because our Mighty Fire Breaker™ applied science when its applied to the wood structures breaks the chemical reaction that fire needs to be able to advance. We are not looking to replace the need for firefighters we are just trying to make there jobs safer on buildings that’s are defended during construction and framing.